When corpora began to be used in a systematic way for the empirical study of translation, Tymoczko (Computerized corpora and the future of translation studies. Meta 43(4):657, 1998) claimed that the appeal of corpus studies lay in their potential “to illuminate both similarity and difference and to investigate in a manageable form the particulars of language-specific phenomena of many different languages and cultures”. Today, the envisioned role of corpora as invaluable repositories of data for carrying out contrastive analyses across languages and cultures is a reality in descriptive as in applied studies. Becher, Viktor. 2011. 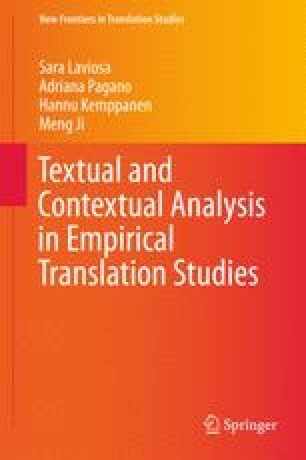 Explication and implicitation in translation: A corpus-based study of English-German and German-English business texts. Unpublished PhD Dissertation. University of Hamburg. http://ediss.sub.uni-hamburg.de/volltexte/2011/5321/pdf/Dissertation.pdf. Accessed 18 Nov 2014. House, Juliane. 2008. Beyond intervention: Universals in translation. Trans-kom 1(1): 6–19. http://www.trans-kom.eu/bd01nr01/transkom_01_01_02_House_Beyond_Intervention.20080707.pdf. Shlesinger, Miriam. 1998. Corpus-based interpreting studies as an offshoot of corpus-based translation studies. Meta 43(4): 486–93. http://www.erudit.org/revue/meta/1998/v43/n4/. Accessed 18 Nov 2014. Steiner, Erich. 2005. Explicitation, its lexicogrammatical realization, and its determining (independent) variables—towards an empirical and corpus-based methodology. SPRIK reports. Reports of the project languages in contrast (Språk i kontrast) 36. http://www.hf.uio.no/ilos/forskning/prosjekter/sprik/pdf/Report_36_ESteiner.pdf. Accessed 18 Nov 2014. Tymoczko, Maria. 1998. Computerized Corpora and the future of translation studies. Meta 43(4): 652–60. http://www.erudit.org/revue/meta/1998/v43/n4/. Accessed 18 Nov 2014.